Here’s a pic of the brake side of my rearsets. The original switch is in use. It’s been too long since the installation to remember which springs were used. Between Lightech and the OEM parts, I had everything I needed. They’re different and probably much better, because they were plug and play. Here’s mine without the brake switch connected. this one in the picture of Srosa are gilles tooling rearset not lightech . Finally got around to finishing. Success! Brembo RCS19 installed and cruise control still functions! Thanks for everyone who helped in this thread. Post up how you actually did it so others can benefit. 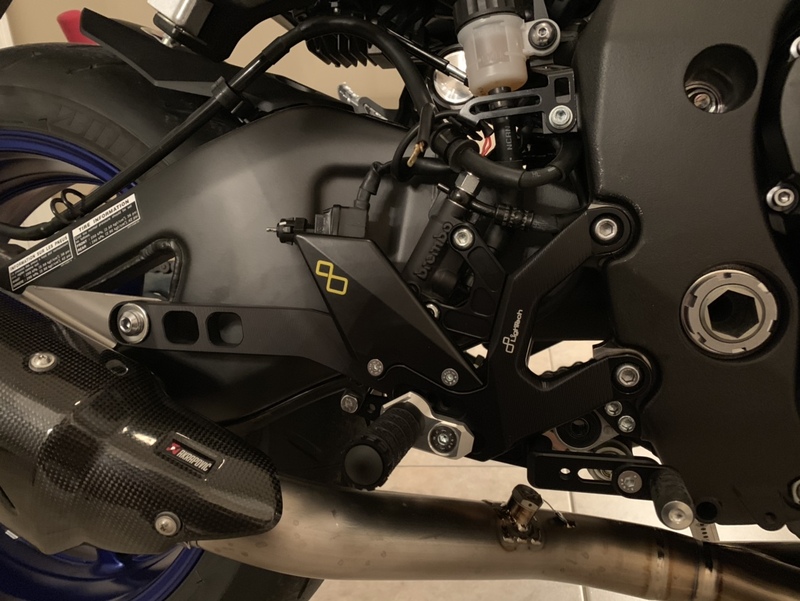 a.	Brembo RCS19 – Be cognizant of fakes on the market. Every Brembo product comes with a scratch card that contains a code to reference on Brembo’s website to ensure authenticity. b. Brake fluid reservoir – I went with Brembo part# 110A26385. It’s not perfect and required minor “surgery” to the rubber gasket to get a 100% seal, but it’s working fine now. c.	Marquardt Switch part# 1022.2201 – This plugs right into the RCS19. Some have cut the metal tab off. I just bent mine and left it connected. d.	Brake lines – I’m not 100% certain this is required, as I didn’t try to make the stock lines fit. I went with Fren Tubo with a 10mm longer than stock line and 45 degree mc banjo angle. These lines retained the stock hardlines as well. Of note, the brake lines were the only difficult, time consuming part of this install. Everything else was VERY easy. a. The stock brake switch has 4 wires connected, 2 red and 2 black. If you pull back the rubber wire loom, you’ll see that these are connected to 2 green and 2 yellow wires. b. Create 2 pairs of wires from the stock wires mentioned in step 2. Each pair will have 1 yellow wire and 1 green wire. I don’t remember exactly which green and yellow go together, but it will only take a couple trial-and-error tests to figure this out. e. If pulling the brake lever doesn’t trigger the brake light or if pulling the clutch lever does trigger the brake light, then it’s not correctly wired. Step 5: Install brake lines and reservoir, bleed your brakes, and enjoy! I haven’t done any extensive riding yet, as I’m still installing some other parts on my bike. Some quick bursts near home proved awesome modulation and power. I installed Vesrah RJL pads front and rear as well. I didn't test out each brake upgrade by itself. So, I can't really comment on which upgrade gave the biggest improvement from the stock brake package. You have 2 red and 2 black cables if you cut them quite at the end of the wiring (end in direction of the switch), otherwise you will have other colors . from 2,5 mm cable pass to 2 mm cable and the colors changes .